Here’s another pattern﻿ based on the trunk of a palm tree. *shakes head* There is just no beating Mother Nature when it comes to creating designs. All we can do is study and learn. Pindo could probably be considered a tangleation, though I’m not sure of exactly what pattern. Because, like many patterns it is based on repeating rows of a shape. In this case, the shape is a triangular wedge. A row of large wedges is laid down, and the smaller wedges are repeated in a triangular pattern. Variations could be created by varying the shape. Imagine this done with ovals or rectangles. I didn’t add this image in with the steps because it becomes difficult to keep the large wedge shapes even, but keep it in mind when you are working step 3.
oh my!wild,luxuriant, fabulos fantasy world !!! 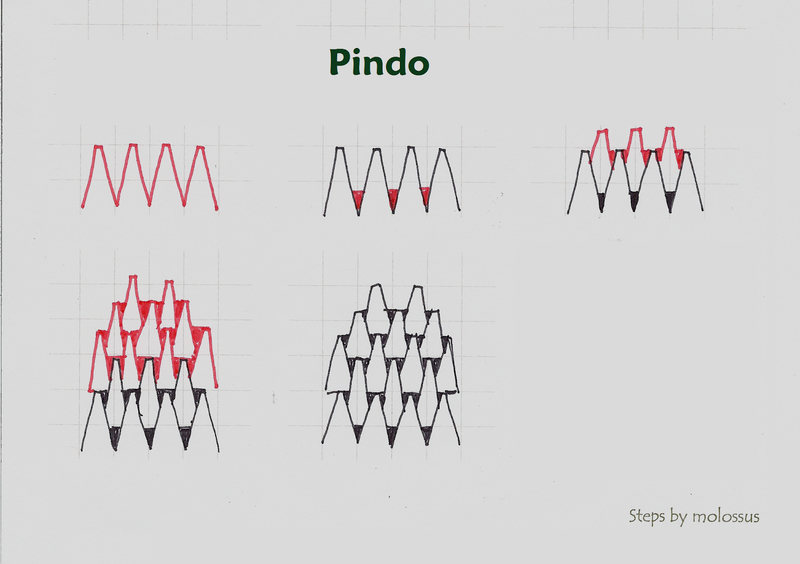 love the pindo,especially when you develope it in your composition! Yes, echoing the above. No other word sprang to my mind as quickly as “glorious”. “Mysterious” was my immediate reaction. It's definitely epic in proportion!